Announcement Please observe current lead times which are stated clearly in each listing in my shop. Cancellations and refunds will NOT be granted after purchase due to lead time issues. Please feel free to contact me PRIOR to purchase to see if an item can be made and shipped to suit your schedule. Please refer to the confirmation email you received after your purchase for the estimated lead time for your order. You received this email after your purchase from Etsy, and it includes a note from me stating the lead time of your order. If your package is returned to me due to an error in address on your part or if the package is refused at the address you provided (this happens a LOT with work addresses and apartment buildings, so please be sure the package can be accepted at your workplace/building before choosing to have the piece shipped to address) and returned to me, I'm happy to ship the item out to an alternate address, AFTER you have paid the shipping fee again. I'll contact you with a Paypal invoice for shipping and will get the package right out to you once the invoice is paid. 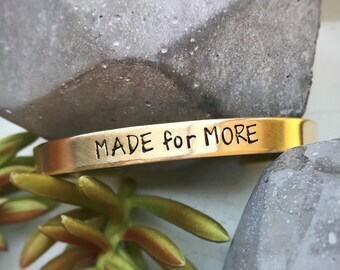 Personalized, hand stamped jewelry creations, handmade accessories and handmade, custom designed pieces just for you! 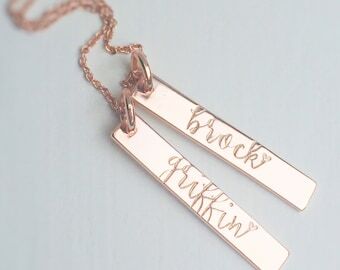 Hand Stamped jewelry makes for a thoughtful, unique gift with heirloom potential. Please observe current lead times which are stated clearly in each listing in my shop. Cancellations and refunds will NOT be granted after purchase due to lead time issues. Please feel free to contact me PRIOR to purchase to see if an item can be made and shipped to suit your schedule. Taking a breather for the weekend. Internet is spotty, so if you message me and I don’t get back to you until Monday, that’s why. I appreciate your patience while I take a few family days. Production will resume Monday. Happy Labor Day weekend, friends! 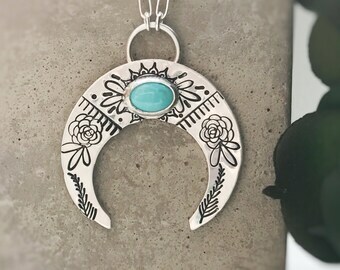 Working on a customer fave, our crescent moon pendant on which I’ll set a little piece of pretty Sleeping Beauty turquoise. One of these days I’ll make myself one, I just love this piece! Finishing some metal under my benchtop dust collector using my trusty flex shaft. So honored to have been featured by Etsy in the "Quit Your Day Job" series. I've learned so much from the amazing artisans featured in the past. It is my pleasure and such an incredible honor to be able to return the favor. The jewelry creations of River Valley Designs reflect a minimalist aesthetic but just as strongly they speak to the heart. Whether it’s a Mom necklace for her or a monogrammed tie tack for him, clean lines and classic forms with a lighthearted touch define owner-designer Danielle Watt’s bespoke line. But look closely and see painstakingly applied, hand-stamped sentiments that express something singular about the wearer. Watt meticulously handcrafts her designs from sterling silver using a range of metalworking techniques. Her joy is capturing the wearer’s unique story with her hand-stamping tools to create a piece of heirloom quality jewelry that will be worn today and treasured tomorrow. In addition to catering to private customers, River Valley Designs jewelry is a popular choice for inclusion in celebrity swag bags and has been gifted to, among others, Amanda Seyfried, Mila Kunis and singer Jordin Sparks, who was photographed in September 2012 wearing a River Valley Designs bracelet as she received her Power of Youth Award. Also in 2012, the company’s custom-designed sterling silver guitar pick pendants, which sport the adage, “Where Words Fail, Music Speaks,” were part of the official gift bag/lounge for the 46th annual CMA Awards. Each River Valley Designs piece is custom made to client specifications. Customers can learn about the company, check out available designs and place orders at www.rivervalleyjewelry.etsy.com. Danielle Watt is a resident of Shadyside, Ohio and has been creating jewelry since 2009. When not busy at the jeweler’s bench, Danielle enjoys spending time with her son. As a Registered Veterinary Technician she also donates time to Animal Balance, a non-profit organization that conducts large volume spay and neuter clinics in remote areas of the world. Welcome to River Valley Design's Etsy shop! Home to unique, handcrafted jewelry items. Custom orders are very welcome, please convo me at any time. The following policies are subject to change at any time at the discretion of the shop owner.